The cylinder of an IC engine constitutes the basic and supporting portion of the engine power unit. Its major role is to provide space in which the piston can work to draw in the fuel mixture or air (depending upon spark ignition or compression ignition), compress it, allow it to expand and thus generate power. The cylinder is generally made of high-grade cast iron. In some cases, to give greater strength and wear resistance with less weight, chromium, nickel and molybdenum are added to the cast iron. The piston of an engine is the first part to begin movement and to transmit power to the crankshaft as a result of the pressure and energy generated by the combustion of the fuel. The piston is closed at one end and open on the other end to permit direct attachment of the connecting rod and its free action. The materials used for pistons are grey cast iron, cast steel and aluminium alloy. However, the modern trend is to use only aluminium alloy pistons in the tractor engine. These are made of cast iron on account of their ability to retain bearing qualities and elasticity indefinitely. The primary function of the piston rings is to retain compression and at the same time reduce the cylinder wall and piston wall contact area to a minimum, thus reducing friction losses and excessive wear. The other important functions of piston rings are the control of the lubricating oil, cylinder lubrication, and transmission of heat away from the piston and from the cylinder walls. Piston rings are classed as compression rings and oil rings depending on their function and location on the piston. Compression rings are usually plain one-piece rings and are always placed in the grooves nearest the piston head. Oil rings are grooved or slotted and are located either in the lowest groove above the piston pin or in a groove near the piston skirt. Their function is to control the distribution of the lubricating oil to the cylinder and piston surface in order to prevent unnecessary or excessive oil consumption. The connecting rod is connected to the piston through the piston pin. It is made of case hardened alloy steel with precision finish. There are three different methods to connect the piston to the connecting rod. This is the connection between the piston and crankshaft. The end connecting the piston is known as small end and the other end is known as big end. The big end has two halves of a bearing bolted together. The connecting rod is made of drop forged steel and the section is of the I-beam type. This is connected to the piston through the connecting rod and converts the linear motion of the piston into the rotational motion of the flywheel. The journals of the crankshaft are supported on main bearings, housed in the crankcase. Counter-weights and the flywheel bolted to the crankshaft help in the smooth running of the engine. The crankshaft and camshaft are supported on anti-friction bearings. These bearings must be capable of withstanding high speed, heavy load and high temperatures. Normally, cadmium, silver or copper lead is coated on a steel back to give the above characteristics. For single cylinder vertical/horizontal engines, the present trend is to use ball bearings in place of main bearings of the thin shell type. 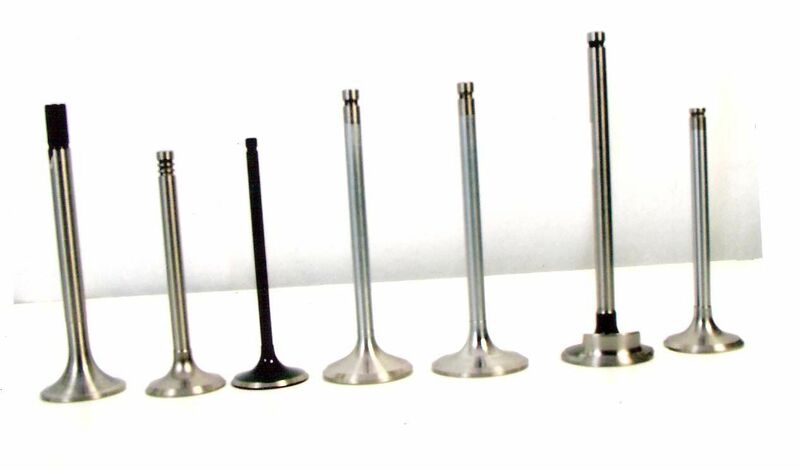 To allow the air to enter into the cylinder or the exhaust, gases to escape from the cylinder, valves are provided, known as inlet and exhaust valves respectively. The valves are mounted either on the cylinder head or on the cylinder block. The valves are operated by the action of the camshaft, which has separate cams for the inlet, and exhaust valves. The cam lifts the valve against the pressure of the spring and as soon as it changes position the spring closes the valve. The cam gets drive through either the gear or sprocket and chain system from the crankshaft. It rotates at half the speed of the camshaft. This is usually made of cast iron and its primary function is to maintain uniform engine speed by carrying the crankshaft through the intervals when it is not receiving power from a piston. The size of the flywheel varies with the number of cylinders and the type and size of the engine. It also helps in balancing rotating masses.